Saudi Arabia’s agreement to purchase the S-400 anti-aircraft Triumf anti-missile system from Russia is a major blow to the United States and its European allies. 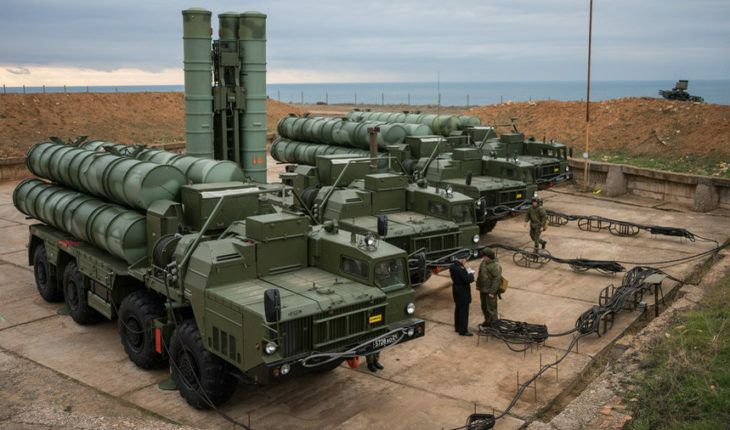 Among other countries with the S-300 system are Greece, a NATO ally who got them from Cyprus when the Turks threatened Cyprus with war unless the country gave up its missiles. Thus, they were given to Greece to defuse a crisis with Turkey. There are other users of these systems. There is China, of course, but also India, Ukraine, Venezuela and NATO member Bulgaria, to name a few. But the S-400 is the real game changer. The reason is the multiple intercept missiles the S-400 system can fire. The S-400 supports four different missiles – the very long range 40N6E-series (400 km), the long range 48N6 (250 km), the 9M96e2 (120 km) and the short range 9m96e (40 km). By comparison the US Patriot system supports only one interceptor missile with a range of 96 km. But there is more. The 9M96E2 is one of the jewels of the S-400 system. It flies at Mach 15 (around 5,000 meters per second or 18,500 kph), it can engage targets as low as 5 meters off the ground, and it can maneuver pulling up to 20 Gs (a human can withstand no more than 9 Gs with special pressure suits and helmets and for only a few seconds). It is designed to knock out penetrating aircraft and missiles flying “off the deck” or just above ground and neutralize cruise missiles. Dr. Carlo Kopp, one of the world’s top aerospace experts, says the S-400 has optional acquisition radars designed to defeat modern stealth aircraft such as the F-22 and the F-35. They work by operating in multiple frequency bands including both VHF and L bands that can “see” stealth-protected fighters. Stealth designs have been built on low-detection by X-band radars, the most common military and civilian radars (others such as C-band – now known as the G/H band – are less prevalent). The F-35 has stealth protection mainly in the front of the aircraft, meaning that when it turns away from its target it is vulnerable. In time, the entire air defense system of the US and its allies, all based primarily on X band, will become obsolete as China and Russia move toward stealth aircraft and missiles. One use of the S-400 long-range missile is against stand-off systems including flying command posts and aircraft such as the E-3 Sentry AWACS. These aircraft, which are used by the US and its NATO allies with a squadron stationed in Japan at Kadena AFB and in the UAE at al-Dhafra, are vulnerable to S-400 interceptors and lose their stand-off range protection. We may be reaching the end of the AWACS capability, which were originally designed in the 1960s. The S-400 also has capability against ballistic missiles, a feature that surely attracted Saudi Arabia’s interest. How good it is against ballistic missiles? No one knows for sure. The Saudi decision to buy the S-400 is probably linked to Egypt’s earlier purchase of the S-300VM and desire to get the S-400. Saudi Arabia and other Gulf states probably paid for Egypt’s weapons. The Russians have definitely made a breakthrough with sales of weapons to some NATO countries with uncertain futures in the bloc (e.g. Greece, Turkey) and strong US client countries such as Saudi Arabia and other Gulf states such as the UAE. One immediate new example: Russia says the UAE is just months away from buying the formidable Su-35 multirole fighter jet, the current Queen of the Russian Air Force fighter fleet. The Russian breakthrough makes sense in technological terms. The US does not have a true competitor to the S-400 system and the US is not anxious to see such systems proliferate. Too bad and too late.